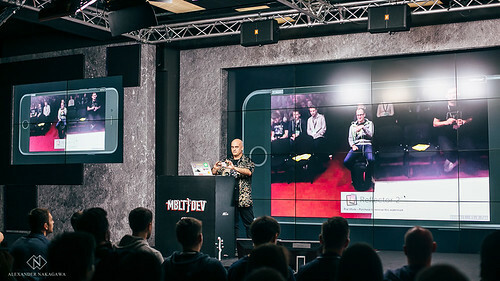 Check out the highlights of MBLTDev in Moscow, including a few demos of augmented reality tools for iOS development as part of ARKit. Been a while since we got around to making a post here - these days, if you want to keep up with what we're doing you have a much better chance of doing it over at our travel blog everyworldheritage.site ... or following @everywhs on Twitter ... or subscribing to us on Youtube ... or Instagram ... or Facebook ... or even Pinterest. Yep, we're giving a full-on shot at this "travel influencer" thing. 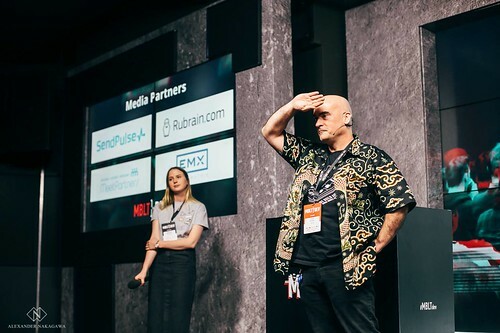 Yep, there we are with our audience participation ARKit demos in progress, wearing our new signature Indonesian batik dragon presentation shirt. Want another look? More photos in this Facebook album, and if you'd like to check out the slides, they're the first download here on Google Drive; the video itself appears to be restricted to participants, or at least people with an MBLTdev account, but if you do, check it out. ARSelfie: Demonstrates adding an SKLabelNode to a tapped ARAnchor in an SKScene with the current top result from a classification MLModel. ARWorld: Demonstrates adding an SCNNodev collection to an ARSCNView representing the results of an MKLocalSearch for nearby POI. ARCloud: This was the ... overenthusiastic ... stretch goal here, we'd planned some Really Cool persistent presence demos using the Estimote gear, as iBeacons are one of those things we've never quite had the opportunity to get into as much as we wanted to, so this was a good excuse! Well, that didn't quite work out; we went to our Plan B of just shoving some ARKit glitter on top of a stock proximity detection sample pretty much. But it all came off amusing the audience to all appearances, so hey we'll call that a win. So that was a great change in every way from the glorified product demos that have tended to mark our speaking career so far, and it was definitely a good conference all around; if you have a hankering to visit Moscow, definitely recommend you plan it around an MBLTdev conference!